The UK government has taken four months to work out what almost everyone knew all along. Splitting off the toxic assets of Royal Bank of Scotland into a separate bad bank is a bad idea. The 81 percent taxpayer-held bank will now pursue an eminently more sensible plan to build capital by shrinking non-core assets more quickly. Had RBS spun off its worst assets in 2010, it might have avoided criticism of the type meted out by Andrew Large on Friday. His study found that RBS’s ongoing quest to shrink 258 billion pounds of non-core assets distracted attention from small business lending. With non-core assets now below 50 billion pounds, an independent bad bank is superfluous. Creation would crystallise big losses upfront, run into European state-aid regulations, and take 12 to 18 months. New Chief Executive Ross McEwan’s alternative makes more sense. RBS wants to offload its U.S. Citizens bank by the end of 2016, and reshuffle non-core assets so that the worst – which consume 20 percent of group capital – are wound down. It also wants between 55 and 70 percent of this “internal bad bank” to be disposed of by 2016. As investors seemed to realise on Nov. 1, the gain comes with pain. Shares fell 6 percent. McEwan’s plan could mean accelerating losses, requiring higher near-term provisions and lower profit. That could make it harder for RBS to pay a dividend in the short term. And that’s probably why UK Chancellor George Osborne isn’t talking up a Lloyds Banking Group-style share sale any time soon. McEwan could have tried to square the circle by retaining Citizens and shrinking the internal bad bank more slowly. But this would have clashed with the way UK regulators are implementing new Basel III rules, which will almost certainly push up required capital ratios. RBS is now targeting a 12 percent core Tier 1 ratio by the end of 2016. RBS still has worrying legal issues to address, like a multi-bank global probe into alleged forex manipulation, and a potentially hefty fine for issuing duff mortgage-backed securities. Still, McEwan’s plan does enable RBS to make a fresh-ish new start. Reuters: RBS to put problem loans in internal "bad bank"
Royal Bank of Scotland is to place 38 billion pounds of its assets into an internal “bad bank”, after an independent review concluded that transferring them into a fully independent entity was unjustified. The new structure will be up and running by the end of the year. RBS will then aim to remove 55 to 70 percent of the assets in 2014 and 2015. It intends to wind up the internal bad bank entirely by the end of 2016. The faster run-down of higher-risk assets is expected to consume 20 percent of RBS’s capital. It is also expected to require an impairment charge in the fourth quarter of 4 to 4.5 billion pounds. Nonetheless, RBS will target a core Tier 1 ratio under fully-loaded Basel III rules of 11 percent by the end of 2015, and 12 percent by the end of 2016. At present it is at 9.1 percent. RBS also said it would accelerate the divestment of Citizens, its U.S bank, with a partial flotation planned for next year. It will aim to fully offload the business by the end of 2016. Around 17 billion pounds of core assets, including some from Ulster Bank, will be transferred to the internal bad bank, while about 16 billion pounds of currently non-core assets will return to the core bank. 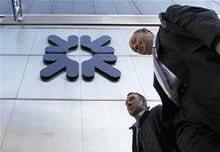 RBS’s total income was 4.4 billion pounds in the third quarter, compared to 3.9 billion pounds in the same period in 2012. The bank made a pretax loss of 634 million pounds in the third quarter, compared to a 1.4 billion pound pretax loss in the same period in 2012. As of 1200 GMT, RBS shares had fallen 6.3 percent to 353 pence.